2. U.S. Fish & Wildlife Service. 1978. Predator damage in the west: a study of coyote management alternatives. Washington, D.C. 168 pp. 3. Wagner, F. H. 1988. Predator Control and the Sheep Industry. Regina Books, Claremont, CA. 230 pp. 4. Markham, D. 1990. Llamas, the ultimate sheep guard. Llamas Magazine, Sept. 4: 101-105. 5. Franklin, W. L. and K. J. Powell. 1993. Guard llamas. Iowa State University, Ames. Extension Bulletin Pm- 1527. 12 pp. 6. Markham, D. 1992. Llamas, effective sheep guards. The Shepherd, Aug. 37: 18-19. 7. Markham, D. 1993. 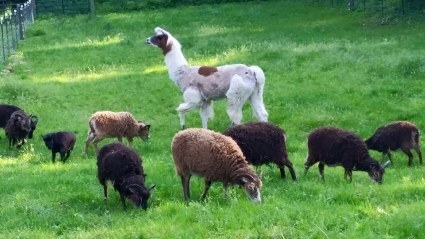 Warning to coyotes: This sheep ranch is guarded by llamas. Rocky Mountain Feed and Livestock Journal, Jan. 19: 29-33. 8. Johnson, R. 1992. Brave beast keeps coyotes at bay for sheep rancher. The Denver Post, April 2 1. 9. Green, J. S. and R. A. Woodruff. 1989. Producers rate their guard dogs. National Wool Grower, April. 79: 6-10. 10. Markham, D. 1990. Llamas, the ultimate sheep guard. Llamas Are The Ultimate. Snake River Llamas, Idaho Falls. ID. 286 pp. 11. Acknowledgment. Glen Frame's willingness to share his long-term experiences in utilizing llamas as guards.